Atlantic City police are investigating a stabbing that left a man badly wounded Sunday night. 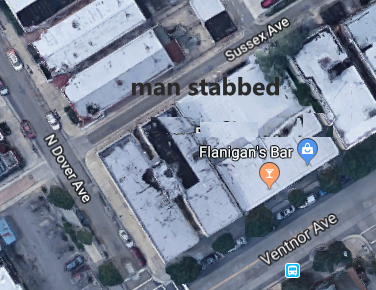 The man walked into Flanigan’s Bar at 3919 Ventnor Ave., bleeding from his neck, a source told BreakingAC. An ambulance and firefighters were on scene. A blood trail led to Sussex Avenue, an alley off Dover Avenue and just behind the bar. Atlantic City Police Sgt. Kevin Fair confirmed there was a stabbing, but was waiting for details from detectives. Anyone with information about this attack is asked to call police at 609-347-5766. Information may also be texted anonymously to tip411 (847411), beginning the text with ACPD.